The University of Newcastle (UoN) has recently completed its first large-scale installation of printed solar panels. Cameron Grimes takes a look at how this new technology works and the benefits it can provide. With Australia’s energy crisis at the forefront of concerns, the need for a more sustainable and cost-effective solution is heavily sought after. The University of Newcastle (UoN), and its team at the Centre for Organic Electronics, is leading the charge for change. 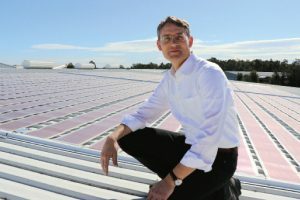 Led by Professor Paul Dastoor, the University recently completed the first commercial installation of its organic printed solar cell panels. The installation involved the (literal) rolling out of 200m2 of solar cells on a large industrial building in Newcastle. It took five people one day to complete the installation. Paul says that the material used in printed panels has a number of benefits over the traditional silicon panels, the most important of those being the durability. “In traditional silicon solar panels, the silicon is an electronic semi-conductor and it’s those semi-conducting properties that allow them to generate charges when sunlight land on them,” he says. “However, silicon is hard, rigid and brittle. About 30 years ago, it was discovered that there are polymers and plastics that can act as semi-conductors, so that opened the door to be able to create materials that can be dissolved in solutions and then printed and coated at great scale. “The key here is that we’ve got a semi-conductive material that’s a polymer, so it can be turned into an ink or paint. The solar cells are created using a multi-layered structure, where a semi-conductor layer is printed on top of a transparent electrode, with a further electrode printed on top to complete the process. The UoN made use of traditional printing technology to transfer the polymers onto the panels. “It’s a machine that is usually used to print wine labels,” Paul says. “It’s very low tech in terms of the fabrication requirements, so that lowers the barriers in terms of getting solar produced at a really low cost. In its current state, printed solar panel technology has lower efficiency compared to traditional panels. However, Paul doesn’t see this as a concern, considering the ease and cost of manufacturing the modern alternative. “The question around efficiency is a common one. In addition, these panels will of course last a shorter time than conventional solar cells, around two to three years,” he says. “The point is that they’re so cheap to manufacture that the real question that should be asked is, ‘what’s the cost of the energy?’ We’re dealing with a technology where the manufacturing cost is much, much lower. To install the panels on the rooftop, the UoN team took advantage of the simple, yet effective method of using double-sided sticky tape. Paul ensured the tape used would hold the panels down in rain, hail, wind and other harsh weather conditions. “We’ve also built a battery charging system for the panels,” he says. “In terms of the electrical connection, we simply went down to Spotlight, got some studs traditionally used for trousers and punched them straight through. We then connected the wires through that opening. The UoN is entering the final stages of commercial demonstration of its solar technology, with the intention of fully commercialising the product within two years. The next six months will involve the testing and assessing of the recently completed installation. The solar panels will then be removed and recycled, with the hope that they can be used in the manufacturing of new panels. “Through our testing, we will have shown the full life cycle of the technology,” Paul says. “We are now talking about developing a whole series of other large scale demonstrations. “The recyclability of the panels is what I would like to test. I certainly hope that we will be able to achieve this. “This product is eminently scalable. We can produce thousands upon thousands of square metres with very simple printing equipment.